Although chickens are very adaptable, they still need a little extra TLC during extreme weather. Chickens can withstand a lot of weather extremes, but heat is not one of them. Did you know that a sudden increase in temperature is more dangerous for a chicken’s health than a gradual temperature climb? Chickens can become very stressed with sudden increases in temperatures and it stimulates blood flow to move away from vital organs and toward other areas of their body, such as, their combs, wattles and skin, thus making them more susceptible to heat stroke. It is important to understand the dynamics of how chickens react to heat. 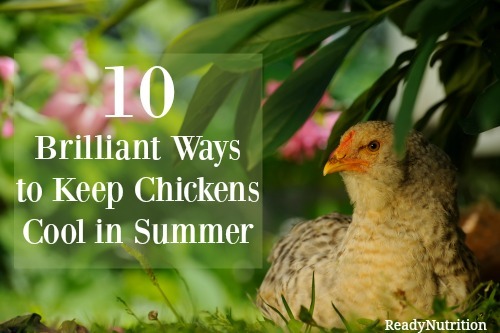 Since chickens don’t sweat, you must be very watchful over them when the warmer months begin. Our feathered friends prefer temperatures staying between 65 F and 75 F. That’s easier said than done in some parts of the country! Are they panting or walking around with their beaks open? Are they hanging their wings out a little distance away from their bodies? Have they become listless or their breathing has become labored? Eating little to no food. If you see any of these signs, one “quick fix” is to make them some homemade electrolytes and set it out for them. This will help restore minerals lost from heat stress and normalize essential body functions for the heart, nerve and muscles. Add electrolyte mixture to one gallon of water. Use full strength on severely ailing chickens, otherwise mix into their drinking water as needed. It should go without saying, but always make fresh water available to your flock of chickens. Water will decrease their internal temperature and cool them off. In addition to this, here are some other ways to help minimize any stress caused from heat. Offer frozen treats. One of my favorite ways to help my girls cool off and treat them at the same time is to freeze some of their favorite foods in ice. Foods such as kitchen scraps, berries, frozen vegetables, etc. If you have a plethora of veggie and/or fruit peels, freeze them in some water, along with some homemade electrolytes and set it outside on a hot day. Trust me, they will love you for it! Alternatively, you could just freeze the food in some water and offer it to them. They will have fun pecking at it. Make sure their coop has enough space. Putting too many chickens in too small of an area, can cause the coop to heat up quickly due to excessive body heat and moisture and prevents them from staying cool. It is recommended that the coop have 4 square feet per bird. Also consider adding a thermometer to see what the temperature is. Ventilate the coop. Ventilating the coop will create good air flow and this will help to move out both the moisture and the heat put off by the birds. Getting good cross ventilation is ideal. One way to do this is by adding vent windows on the sides and in the front and back. This creates good airflow. If you’re not able to get enough airflow with natural ventilation, consider creating a breeze with a fan. Spray around the coop with cold water. Spraying around the coop and the roof can cause evaporative cooling for your chickens. You can also create small pools of water for the chickens to wade in and keep themselves cool or provide a mister. Add some apple cider vinegar to their water. That’s right folks, our favorite natural remedy can be your livestock’s favorite too. By adding ACV to your livestock’s water several times a week, it has health benefits and also increases calcium absorption, which is especially important during the summer months, when the hens’ feed intake goes down and they aren’t ingesting as much calcium as they normally do. Make some mud. Spray a shaded area of dirt with the water hose and break it up with a shovel. Your chickens will scratch at the mud and lose some a bit of heat through their feet that way. As well, they may enjoy a luxurious mud bathe! Freeze some water bottles. Freezing gallon jugs of water is great for your chickens to lean against. Just bury it in their favorite dusting space. This is also great for rabbits too! Offer some shade. If your coop does not have adequate shade, hang some shade cloth or a tarp and create a “shade zone.” This would be an ideal area to add some misters to for extra hydration and also allow the breeze to come through. Did a hole. Soil temperatures remain relatively constant throughout the year, so digging a hole in a shady area may be just what your chickens are looking for. You can also dig a hole next to the one for your chickens and add a frozen gallon sized water bottle and bury it. Give them more fruit. Foods such as scratch and corn require longer digestive process, which can heat the chicken’s temperature. Offering more fresh vegetables and fruits like watermelon will give them more hydration. Make it fun for them by stringing up the fruit and vegetables on strings and hanging it. Although chickens are very adaptable, they still need a little extra TLC during extreme weather. Ensuring that your chickens always have a source of water and some of the suggestions listed above will help them better adjust during the warmer months. Chickens go for watermelon slices in pie tins. Place them out in the shady areas around the free range coop. Place molasses in the water feeder for electrolytes. Mix well for the water feeder.